When is a good time to buy property? The Housing Bubble makes a good start in providing some of the answers to any would-be property investor. This book offers an everyday person's guide to basic economics - the study of supply and demand as it relates to real estate (mainly residential property) - but also considers the ‘wild cards' of fear and greed. He states that there is also a number of factors that influence supply and demand, but may only have a temporary impact, such as interest rates, ease of borrowing, inflation, number of foreign investors. Charts and graphs are used throughout the book to illustrate the above drivers and influencing factors. The book makes a slow start but it is worth persevering with. 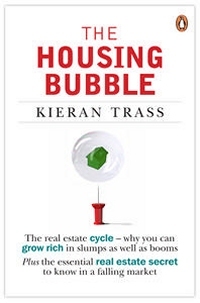 Once the book moves beyond introducing the concepts of the property cycle, Trass' real estate cycle clock and his opinions on the key drivers and influencers, it gets a lot more interesting. Trass cleverly uses the fear and greed factors to build interest in what he believes to be the best times to buy property (or not) and where. Using a longer timeline than the 40-year period of most examples would have helped to reinforce the message that susceptibility to fear and greed is not just a recent phenomenon. The chapter on the psychology of bubbles, guest authored by UK writer Peter Waring, provides some insights on why humans continue to behave like this rather than rationally. However, the graphs, figures and more recent history all provide useful context and will go a long way to help any new investor decide on when to buy property. The chapter summaries were particularly helpful. More experienced investors may have preferred additional information on the supply and demand factors in other markets (such as shares), which also influence any decision on whether to invest in real estate. However, that would have made the book longer and more complex than it needs to be for its likely audience of new property investors. The Housing Bubble covers the boom, slump and recovery phases of the property cycle and offers workable ideas on what to do at each stage. - anytime is a good time to buy if the price and location are right. Why not concentrate on doing property developement; 30years to pay off your mortgage on one home! what an insane concept. I think Mr Trass is well wide of the mark, with his doom-and-gloom scenario out of kilter with where many commentators see the market going. The idea that this highly appealing investment sector will walow along for half a decade is plain nonsense. I'd give it two years before house values are back where we left off mid-2008. The simple mechanics of supply and demand, and the relative unattractiveness of the (highly) volatile equities and commodities markets will see mom and dad investors flock back to property with a vengence. The good news is, they'll be better armed for more effective management this time around. Re Pete's comment. This view sounds like wishful thinking, justified by an emotional outburst and shows an ignorance of the history of property investment. eg Florida property which crashed in the 1930's did not regain its nominal peak until the 1960s and didnt match the inflation adjusted peak until the 1970's. Alternatively, tell this to the Japanese who have now experienced nearly 20 years falling and static property values. i think he means well if it was 2008 read the latest sales figures,in the here and now. Chris's comment of "30years to pay off your mortgage on one home! what an insane concept." shows how greed actually does skew the property market. You can only live in one house at a time! The average person has had to become financially literate to the level of property developer just to "get into the game". However trying to tell my wife that what goes up can (can, not must) come down. Chris said: Why not concentrate on doing property developement? Kieran says: Because "MOST property developers go broke!" (thats a quote from Sir Bob Jones...). I belive this is because they fail to understand (or ignore) the cyclical nature of the industry! When they go broke they or the market 'turns against them' tey throw their hands up and say "It's the market's fault!" YEAH RIGHT! Ignore the cycle at your peril. (just look at all the failed developments and developers who litter the market today). Completely unnecessary if they understood the cycle IMHO! Pete said: The idea that this highly appealing investment sector will walow along for half a decade is plain nonsense. Kieran Says: Hmmmm you forget we are already 2years and 2 months thru this slump (yes it started mid 2007!) so at this point looks like less than 3 years to go. Lets hope it's ONLY that long. This coming from the man who a year back publicly recommended everyone to fix all their loans for 5 years at 8.95%!!! Not very clever Kieran! Interest Rate Watcher... please do not try and rewrite history... Guess you were at one of the PRIVATE seminars I hosted early last year. These seminars were not open public seminars. Yes it was at this private seminar series that I outlined exactly why my belief (and some economists shared this view too at that time) was that there was the real risk of an interest rate SPIKE... At the time I outlined eaxctly why I believed interest rates COULD rise above 10% HOWEVER this was clearly stated as my opinion only and the other presenter at the same seminar disagreed at the seminar (but then he also said property values were not likely to crash so we both got 1 call right and 1 call wrong) I DID NOT "PUBLICLY RECOMMEND EVERYONE FIX FOR 5 YEARS". These seminars were attended only by a paid attendees and the content was not released to the media nor made public knowledge. I did also fix some of my own mortgage debt at that rate and I still have no regrets for doing so (My suggestion to attendees was IN THE CONTEXT OF MINIMISING THE RISK OF AN INTEREST RATE SPIKE at that time NOT CHASING THE CHEAPEST RATE). This was also prior to the Lehmann Brothers collapse and the subsequent interest rate collapse internationally. No-one was talking about the worlds financial system reaching near collapse at the time we did the seminar. Please get the facts straight and in the correct context in future. Its refreshing to see an author provide clarity to the finger pointers that use the beauty of hindsight. I suppose these 'knockers' forecast the economic freeze eh? Before the crash and downward shift in the interest rate cycle, I too recommended to people to fix rates at 9% if they were unable to afford their mortgage payments above 9, 10 or 11%. I personnally think this is good risk mitigation - but that is my opinion. No one, and I mean no one had the view that interest rates would fall so dramatically as they did globally. Even if Kieran didnt recommend people to fix, such a recommendation is prudent in my opinion - based on the circumstances of the individual. What is the poorer scenario? People not fixing and losing thier house or people fixing and paying more in the long run but keeping a roof above their families heads? I have not read any of Kierans books or journals but I do think the peanut gallery needs a good smack across the ears sometimes. Greed all too often gets in the way and people love to point the finger at someone else for their own shortcomings. Lets be honest, 50+ years of data clearly shows that every market operates in a cycle and I am looking forward to reading Kieran's book. I dont expect the book to be perfect, but if there was a perfect answer to investing than we wouldnt invest in it.... because everyone would be doing it because everyone would have the answer. Unfortunately we are a greedy species that at times loves to put one over the other or blame the other.